In the city’s largest real estate announcement of the year, Charter Communications said Tuesday it would relocate its headquarters to the downtown Gateway Harbor Point complex — a move that would double the company’s Connecticut contingent by adding 1,100 jobs. The new headquarters at 406 Washington Blvd. would comprise a 500,000-square-foot, 15-story building, which is scheduled to be ready for employees in 2019. The company has hired Stamford-based developer Building and Land Technology to build the hub, with an option to expand the site into a two-building campus. The project is scheduled to break ground early next year, immediately following expected land-use approvals. “This new, state-of-the-art facility in downtown Stamford will provide Charter the necessary resources to facilitate its continued growth,” Charter CEO and Chairman Tom Rutledge said in a statement. Charter has been based in its current downtown location, at 400 Atlantic St., since it moved in 2012 from St. Louis. It employs about 1,100 in the state, according to state Department of Economic and Community Development data. Charter officials said they chose the Gateway site, where a parking garage currently stands, because of its proximity to the downtown Metro-North train station and Interstate 95. The new headquarters would become the first commercial facility with “direct access” to the downtown station’s platform, company officials said. They also cited the large floor plans envisioned for the building, which they said would make office design more flexible. Charter plans to make $100 million in capital expenditures in Connecticut during the next few years, company officials said in their announcement of the move. The company declined to comment on the expected cost of the new building. The company has been considering a move for at least several months, with Hearst Connecticut Media learning in June from company sources that the firm was looking at sites in Stamford. A message left Tuesday for The Landis Group, which owns and operates 400 Atlantic St., was not immediately returned. Charter was represented in the deal by the commercial real estate firm Cushman & Wakefield. The company needs a new hub to support its growing operations. Last year, it acquired Time Warner Cable and Bright House Networks for a total of about $65 billion. With the merger, Charter expanded its reach to about 50 million homes and businesses and became the second-largest cable company in the country, after Philadelphia-based Comcast. During the past five years, it has enlarged its footprint from one floor to eight levels in the approximately 500,000-square-foot building at 400 Atlantic St. In total, Charter employs about 92,000 people, with plans to hire about 20,000 during the next four years and invest $25 billion in broadband infrastructure and technology. Based on earnings, Charter represents the largest public company headquartered in Fairfield County. With some $29 billion in revenues last year, it took the No. 96 position in this year’s Fortune 500 rankings. Charter shares closed Tuesday at about $37, up about 1.5 percent from their closing price Monday. 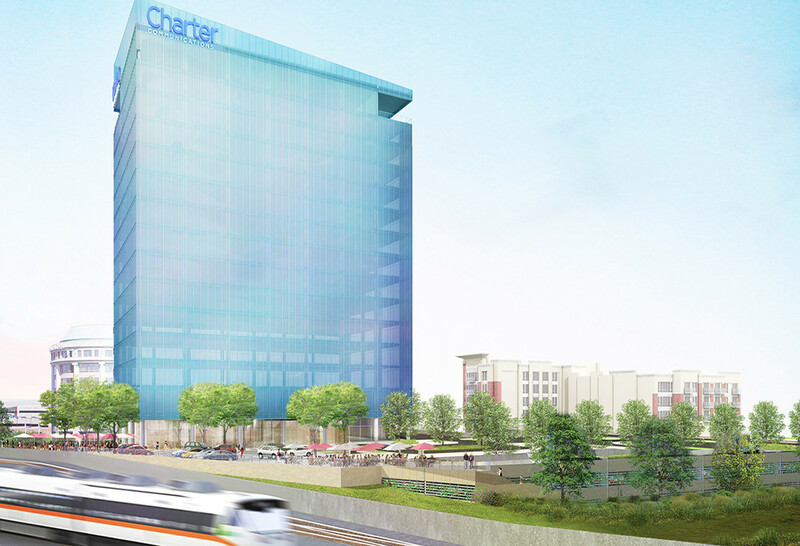 To support the new headquarters, Charter is in line to receive from the state a direct loan of $10 million and up to $10 million in tax credits. Additional tax credits would be available if Charter reached certain hiring benchmarks. Other companies with headquarters or major offices in Stamford that are receiving state aid include Henkel, Synchrony Financial, NBC Sports Group, Deloitte, Navigators and Pitney Bowes.